Sta. Petka or Sta. 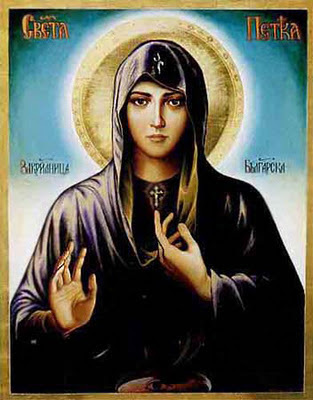 Parasceve is one of the most cherished and loved saints in the Balkans. This 11th Century saint who passed on to the Holy Host, embraced by Mary, Mother of God and St, Michael at the age of 27 continued to make miracles immediately after her death and until this very day. One famous account tells how she appeared in dreams to a monk some nights after her burial, informing him that her resting place was not good, that she was in ill soil. They unburied the body and found it incorruptible and sent the relics to the Church of the Holy Apostles in the little city of Katikratia. Her relics were then moved around in the Balkans, Moldavia and Constantinople. Constantly miracles happened by her intercession – which caused even a Muslim reverence for her where her relics worked its wonder. Two feast days are ascribed to her October 14 and October 27, representing two different mysteries. October 14th is marked by a communal festivity, merry making and chain dances. In the past this date marked the first day of rest upon having completed all matters concerning the farm’s survival during the cold months of winter. It was important to observe her taboos on this day, like not wearing woolen clothes, don’t engage in spinning or taking bath. The 27th on the other hand is subject for a secret celebration and represents a different mystery. Here we find the ‘pagan’ remains that she gave a face and form playing itself out. She is the mystery of Crucifixion, she shows herself as serpent when she try to warn her devotees – or if taboos have been broken. She shows herself in the shape of a wolf – which is her true shape – and here she invites the night ride as the Queen of the Ladies of the Night. As we ride out in this night of wolves as One! In this wild night of Sta. Petkas host!